CHST Exam Prep Course - Hurry Seating is Limited! An analysis of government job data by the Associated General Contractors of America reveals that the industry’s unemployment rate of 4.5% is the lowest in 11 years. Conversely, the average hourly wage for construction—$29.06—is up 2.3% from last year and nearly 10% more than the average private-sector job. Having a career in construction is very rewarding and having the CHST certification to back your name exemplifies enhanced professional credibility in the industry. This certification focuses on construction safety management principles and practice and does not require a college degree. 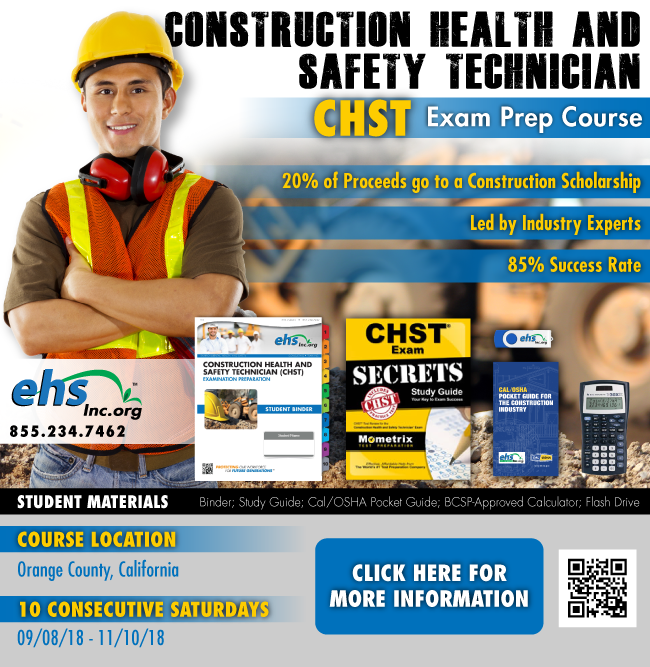 The CHST certification is great for professionals who are interested in pursuing a lasting career in construction or seeking personal as safety and health specialist on construction job sites. We are offering a 10-session (10 consecutive Saturdays) CHST Exam Prep Course at our Irvine location starting September 8th. For more information click HERE or click on the graphic above.